"This is the story of one week in my life. I was seventeen. It was the week I slept in Orson Welles's pajamas. It was the week I fell in love. And it was the week I changed my middle name  twice." 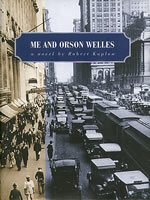 So begins Me and Orson Welles, a comic coming-of-age novel set against the background of the twenty-two-year-old Orson Welles's debut production at the Mercury Theatre on Broadway. Richard Samuels is the stage-struck seventeen-year-old from New Jersey who wanders onto the set one day and gets a small role in Welles's Julius Caesar. His life will never be the same. With humor and pathos, Kaplow evokes a lost era in theatrical history. At the same time, he has created a compelling romantic comedy whose protagonist finds himself in the center of an exhilarating vortex of celebrity, ego, art, and love. Satirist Robert Kaplow is the creator of Moe Moskowitz and the Punsters for NPR's Morning Edition. He is a teacher and the author of four highly acclaimed novels.